Self-care has become synonymous with skin-care these days. Many people talk about self-care in the context of face masks and bubble baths or treating themselves to the newest face serum; all in the name of self-care. While bubble baths and face masks are great ways to unwind and care for yourself, self-care encompasses so much more. We’ve all heard the phrase, “you can’t pour from an empty cup.” In essence, self-care is ensuring your ‘cup’ isn’t empty. 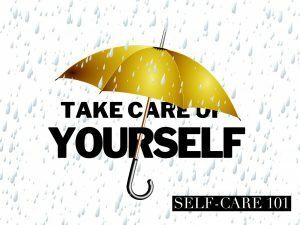 Self-care is checking in with yourself and ensuring your wellbeing. Self-care sometimes means getting out of bed and simply taking a shower. It sometimes means tackling situations you have been avoiding – cleaning your home, figuring out your finances, ending toxic relationships. Self-care sometimes means getting up, getting dressed and facing the day. It is often not luxurious but crucial to our physical and mental health. Below are tips for ensuring your cup isn’t empty. Know yourself and your limits. A big part of self-care is recognizing when you have taken on too much and taking steps to lessen the load. It includes recognizing when you aren’t getting enough sleep or you’re not eating in a way that fuels your body. Find ways to destress throughout your day. It is important to not wait until the end of the day or the work week to focus on yourself but find small things to incorporate into your day. It can include a quick walk, drinking water, spending a few minutes focused on breathing, talking to a friend or coworker. Take time to love yourself. Find ways to celebrate yourself. Write yourself positive affirmations, do activities that bring you joy, be patient with yourself. You are the only you and that is special.